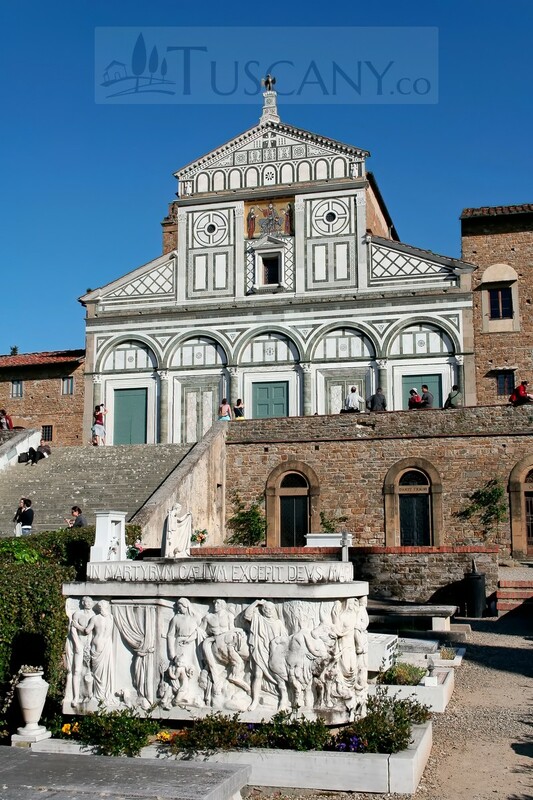 San Miniato al Monte (The Abbey of San Miniato al Monte) is situated at one of the highest points in the city of Florence, Tuscany. Many people refer to this building as one of the most beautiful churches in all of Italy. It is a fine example of Romanesque architecture and is truly, a sight to behold, for all visitors. The construction on this famed church started early in the 11th century. The construction took place over an Oratory which had been constructed by Saint Miniato, himself. He was the first Christian martyr in Florence, who became a victim of the persecutions of Emperor Decius. St Miniato or Minas, was rumored to be an American prince, who had served in the Roman army. Thought to have betrayed the emperor, Miniato was thrown in the Amphitheatre to be devoured by the panther present there. 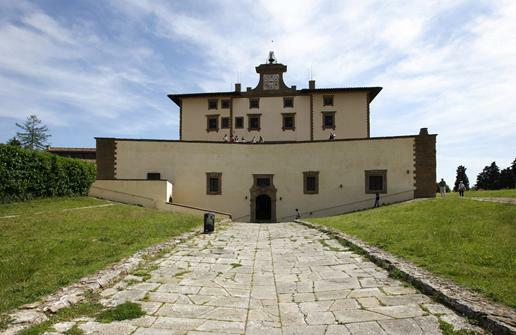 However, the panther refused to devour Miniato, which led the emperor into giving the order of beheading him. 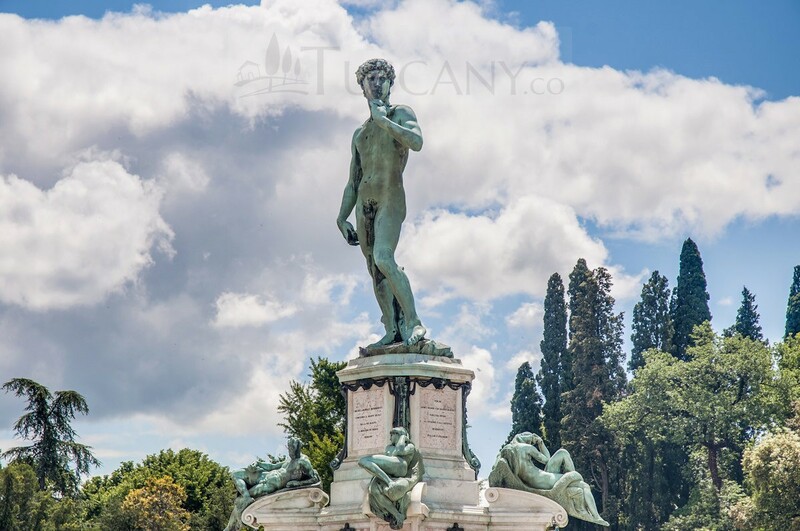 It is a fabled tale which states that Miniato was beheaded in front of the Emperor, but then picked up his head with his own hands, crossed the River Arno, and climbed up the Mons Fiorentinus hill, to his hermitage. He was said to have died in the cave of Monte alle Croci. Later on, at the very spot, where this evangelizer had passed away, the Oratory and the Church were built. Bishop Ildebrando’s efforts lead to the commencement of the church’s construction in the year 1018, which was completed by 1207. White Carrara and green Prato marble were used in building the façade, which was divided into two orders. Inlaid work using a rhombiform made it possible for these orders to be linked with one another. It was accomplished with such skill and mastery that the artists of the following eras used this idea in many of their works; Leon Battista Alberti used this to construct the base of Palazzo Rucellai. The artistic intellect shown by the architectural designs is magnificent and breathtaking. The 13th century mosaic of Christ is situated above the upper order. On each side of Christ are the paintings of Madonna and St. Miniato. At the top of the pediment is an eagle, made out of pure copper; it is the Arte di Calimala’s symbol, which was responsible for distributing and administering the wealth of the Benedictine convent. 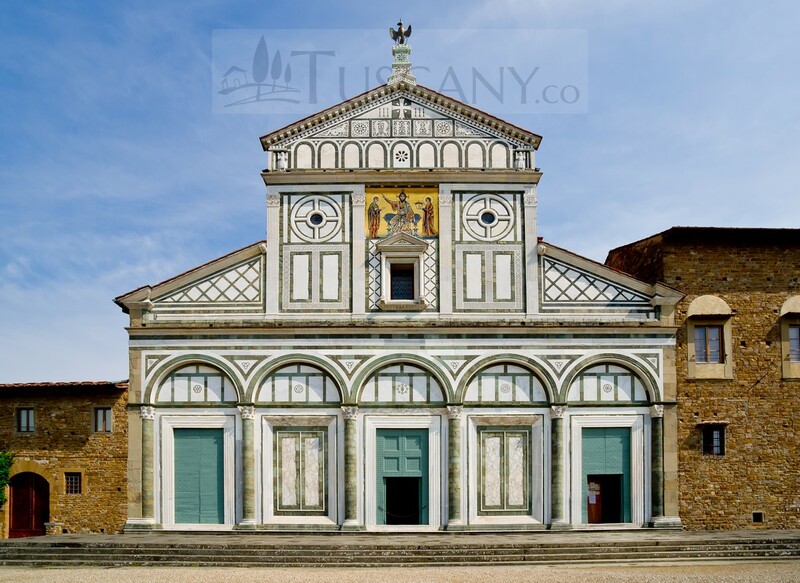 The facade of Santa Maria Novella was an inspiration derived from the façade of San Miniato. Alberti was so inspired by this façade that he used it, not only in the aforementioned work, but also in building the facades of Santa Croce and Duomo. When the sunlight hits the outer part of the monument, a brilliant array of light is created which holds a majestic glamour, the likes of which, has not been seen at any other place. Even the interior has been ingeniously designed to let the light play its magic on the eyes. Every person, who sets foot in this church, gets mesmerized by the scenic beauty it holds. The interior has been designed with clear cut precision; divided into three naves, the floor in the interior of the church is made of marble. The whole marble floor is decorated with Zodiac symbols from the 11th century. The altar, square pulpit, lectern; all of the Romanesque style sculptures hold such brilliance, that other pieces of art pale in comparison. Giovanni di Gaiole and Francesco di Domenico, are famous for designing and making the pulpit. The eagle of St. John is exceptionally stunning, and the crypt is covered with frescoes of Saints and Prophets. The work was done by Taddeo Gaddi. The Chapel of the Crucifix – designed by the famous architect Michelozzo – is beautiful and refined in essence, placed right in the middle of the aisle. The Cappella del Cardinale del Portogallo is universally considered “one of the most magnificent funerary monuments of the Italian Renaissance”, which was built in 1473 as a memorial to Cardinal James of Lusitania, who died in Florence in 1459. This chapel was designed by Brunelleschi’s associate, Antonio Manetti, and finished after his death by Antonio Rossellino. The tomb was made by Antonio and Bernardo Rossellino, while the chapel decoration is by Alesso Baldovinetti, Antonio and Piero del Pollaiolo and Luca della Robbia. The church is a masterpiece of the Renaissance period and contains the remains of St. Minato, which were transferred here, one year after its completion. 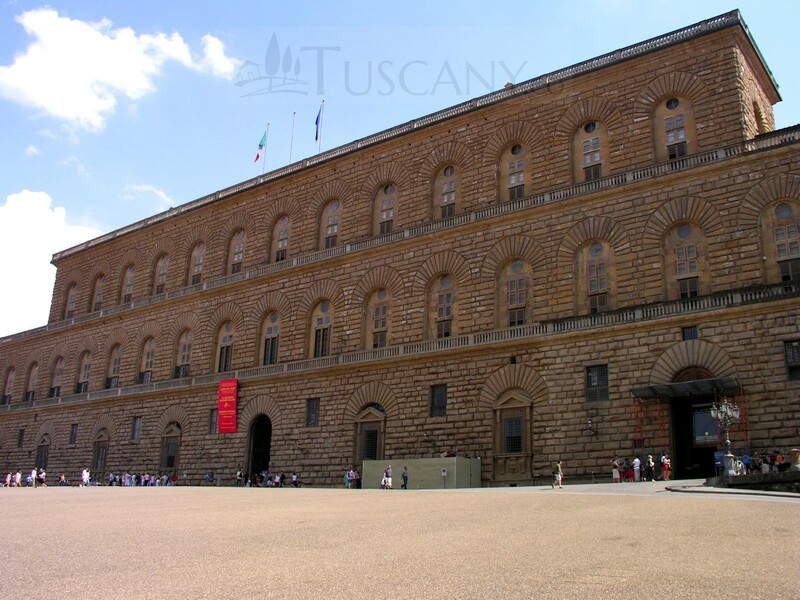 To visit Tuscany, and miss out the chance to see this place of beauty, would be a huge mistake. It is an illuminating sight and must definitely be visited.